“Ag-gag” bills are being introduced around the country in an attempt to censor whistleblowers, investigators, and journalists who expose animal welfare abuses on factory farms and slaughterhouses. Investigations by groups like the Humane Society, Mercy for Animals, and Compassion Over Killing have exposed shocking animal cruelty and consumer health dangers in the food industry. They have led to the largest meat recall in US history, criminal charges, and international media exposure. Rather than put a stop to these abuses, corporations are trying to criminalize the whistleblowers who expose them. 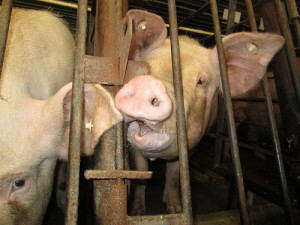 –> Sign the petition at Change.org/AgGag! Will Potter to address the New York Bar Association on ag-gag laws. After photographing Circle Four Farms in Utah from the public street, four people are being prosecuted under the state’s ag-gag law. Ag-gag legislation against photographing animal abuse has been defeated in South Australia, but more bills may be on the way. Beef Magazine says the group responsible for beheadings is “similar” to the Humane Society. A lawsuit challenging Idaho’s ag-gag law as unconstitutional is moving forward, with a supportive ruling by a U.S. federal judge. “One journalist is using drone photography to expose conditions at factory farms in hopes of changing the way we think about food,” says National Geographic.